WhatsApp calling has been activated with the update by of the app some time back but some users are still facing an issue in activating WhatsApp calling option in their Android devices. The Calling feature was activated from the version 2.11.552 and the next version 2.11.561 and now there has been another update by WhatsApp officially which will get the calling facility to your Android device. The latest version by WhatsApp is 2.12.7 which was released just today and the process which you followed with the earlier versions of WhatsApp for activating calling option remains the same. 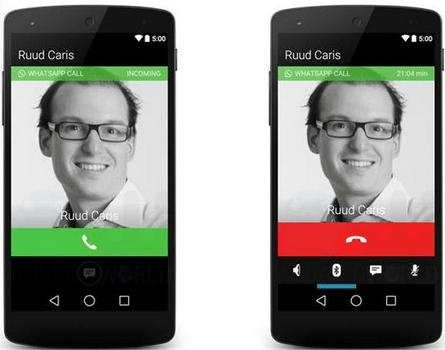 You can check out the Step by Step process here: Activate WhatsApp calling in Android device. The main part of the activation is that you need to get a call on your updated WhatsApp from another user who has the feature already active on their mobile. This latest version might bring the calling feature to all the users of WhatsApp be it Android Jellybean, Android Kitkat, or Android Lollipop. This version of WhatsApp will bring calling feature to devices running on Android 2.1 (Eclair) and later which include the versions mentioned above and this will bring the feature to almost all the Android running devices. Here are the details about the latest version of WhatsApp which will let you activate WhatsApp calling feature on your android devices the installation of the APK file in your device has been explained in the previous post about WhatsApp calling activation. Please let us know if the latest version has helped in activating the calling feature on your device which will show a calling tab and if you need a call to activate your calling feature do leave your number in the comments section and we will try our best to give you a call and keep your number private. You can also update to the latest Official update for WhatsApp here – WhatApp Download. You can restore your previous information from backup. I have installed the latest version on my phone, but getting to register the telephone number by given notification code to access the whatapp access it will bring out message to :try back in 3 (three) hours time almost two day I was unable to access the usage on line. Which step are you facing problem with ?? Check the exact version your device has and make sure download the latest version accordingly. I use Nokia android phone My whatsapp application is not allowing me the whatsapp New version pl. Which device are you trying to install WhatsApp in?? Having a problem of downloading whatsapp. Try to clear cache of Google Play Store and try again. The name of my fone is tablet Telefunken. Am failing to down loading my whatsapp for android. Please help me. I fail to download a new version of whatapp in my photone please help me.